The Grand Secretary Desk is definitely true to its name. At 53" wide and 89" tall, this huge desk certainly has the size required to store and organize all of your office supplies with room to spare. The secretary desk design is popular because it allows you to create a work space in any room of your house. When closed, it simply looks like a large cabinet that blends in with the rest of the room, but when you need to access office supplies, pay bills, or get work done, just fold down the angled front door to form your desk top. Inside the desk top reveals a variety of pull-out drawers and shelves for plenty organizational options. 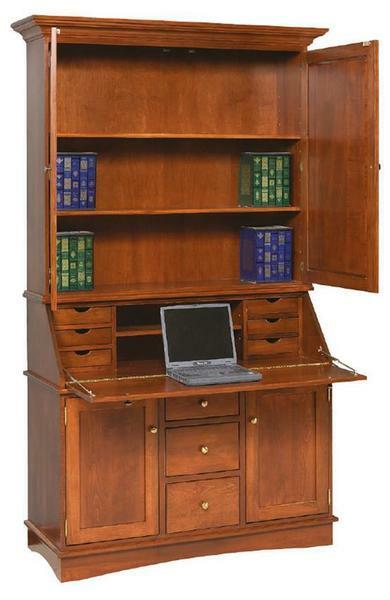 The base also offers a variety of storage options with two cabinet doors and three drawers, plus the large hutch top, which includes three large book shelves behind two solid wood doors making this entire secretary desk one of the largest that we offer here at DutchCrafters, and an amazing piece of office furniture that can turn any room into a productive work station.